Early in the day we may have you casting streamers for Sea Trout on the flats. Then we often switch gears and have you casting shrimp or crab flies to the mangrove shorelines for Redfish and Snook. We could also move out into one of the local gulf passes and look for ladyfish or pompano. Most of our fly fishing charters start early to take advantage of the calm wind conditions that occur most mornings. You’ll be casting an 8 or 9 weight fly rod and you should be able to comfortably cast 50 to 60 feet so that you can keep the fly in the strike zone as long as possible. If you don’t have access to an 8 or 9 wt fly rod you can practice casting with, please give us a call and we will schedule a two hour casting lesson a day or two before your charter. 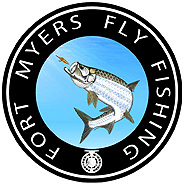 Thanks to the diverse habitats we have here in Fort Myers we are able to give our fly fisherman a wide range of opportunities. The primary goal on this fly fishing charter is to give you the chance to catch as many different species as possible. We realize that you don’t get to go saltwater fly fishing every day, so we want to make the most of your time on the water. Our Ft Myers fly fishing charters are a great way for our clients to learn how to handle stronger fish than they are used to catching on a fly rod.You will be casting the flats for Redfish, Spec Trout, Ladyfish, Bluefish, Snook, and more. Its possible to catch 3 different species of fish on three casts when the conditions are right. The most important thing you can do is practice casting as much as possible with an 8wt or 9wt fly rod. You need to learn how to load the rod so you can minimize the number of false casts needed to cast 50ft. Please remember that we are busy most of the year, so it is important that you book your fly fishing charter as far in advance as you can. If your plans didn’t allow you to book early, let us know and we will work our other fly fishing clients to see if we can find a time and date that works for you.